Looking to make your home office more productive? Experienced interior designers believe that the design and overall environment of your home office can affect the way you work. Working from home offers the opportunity to be at your desk while having immediate access to your home. However, if you aren’t effectively separating your home office design from the rest of the ‘homely’ ambience, productivity might be sacrificed to an extent. 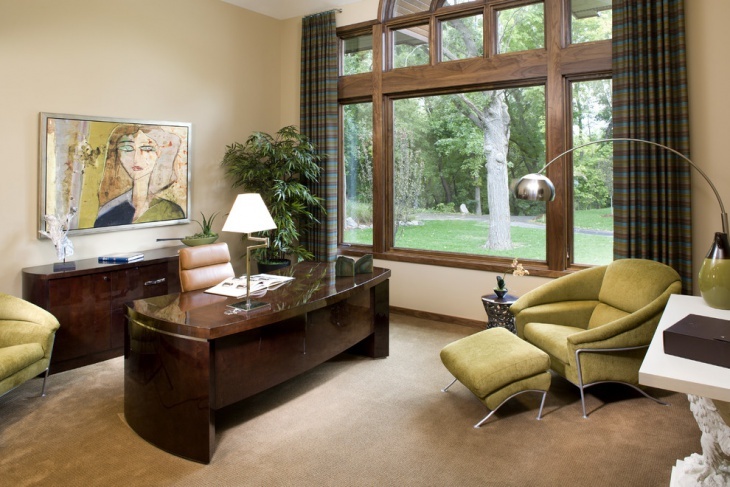 Here are ten home office design ideas that we would like to share. Completely separate from the rest of the rooms, your home office will need to have a personal desk, chairs and wall cabinetry. Further, you will need to see that the room is well lit and promotes all the quality of a professional workspace. 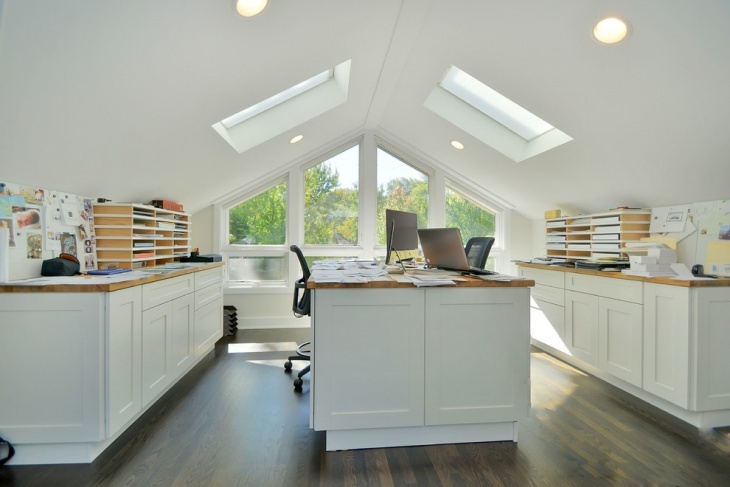 Depending on what you work on, your home office can be a serene space that is well equipped with all necessary cabinetry, electronic equipment and options for storage. Here, the window seat provides an alternative to your desk but nevertheless allows you to be in the room and continue your work. Well, you can always keep an eye on what’s happening in your garden! Striped accents can be a unique theme for your home office. 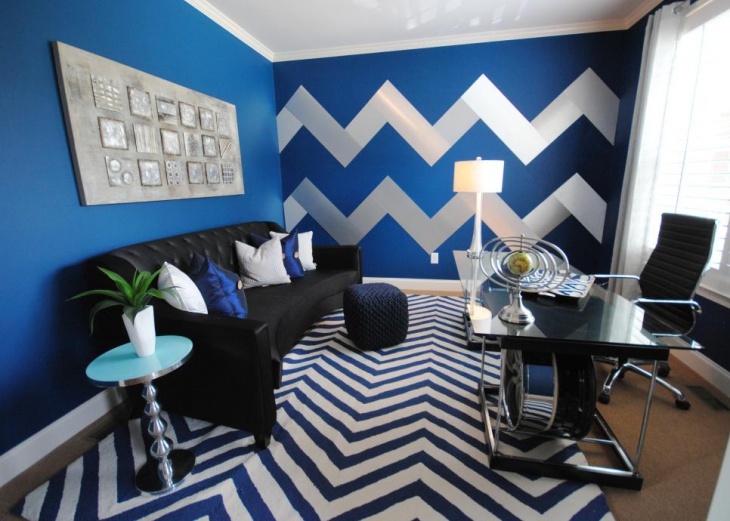 In this example, chevron racing electrifies the floor, walls and even some of the furnishing. You can compliment this home office design theme with metallic and black additions, be it the seating arrangement or the gadgets. If you don’t have a dedicated modern room design to be used as a home office, you can convert one of the smaller spaces and work upon it. The main aspect of the change is to remove everything that looks comfy and might distract you. Your desk becomes the central installation while your cabinetry can showcase can showcase the usual home décor. 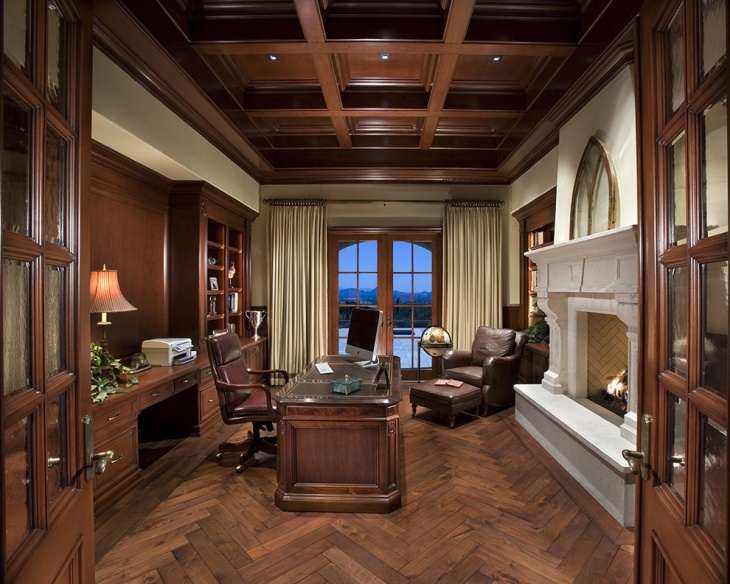 If the rest of your home showcases a traditional décor, your office space can replicate the same. Big cabinetry, a lot of space for books, a large desk and similarly huge chairs will be a perfect match to the rustic theme. The carpet and ceiling lighting too need to evoke the essence of the old world. 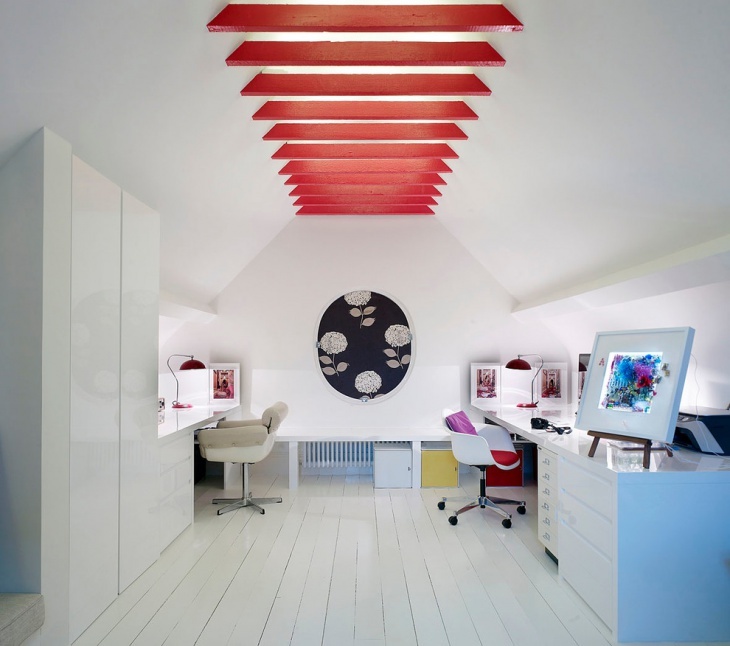 If you have plans to convert your attic space to your home office, this would be the perfect example. Even with no proper windows around, you have enough amount of daylight to brighten up the space. A white theme especially creates the ambience of being in a highly professional space while you are actually sitting atop your home! The main elements of any home office are a big desk, a couple of chairs and the necessary equipment. However small or large be the room space, having these elements in proportion will be the simplest way to create a serious environment. Who said office spaces need to look drab. 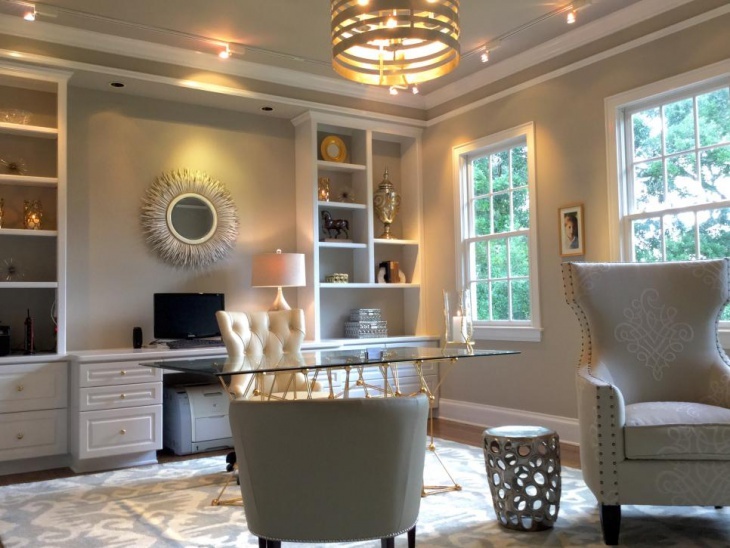 A lot of lighting and décor can go into your home office and yet encourage you to focus better on your work. Interesting keeps you occupied and you will actually be spending more time in this room! Looking for a bit of sun and surf? Well, you office space can have a large window that can directly guide you to the landscape outdoors. Inside, have exotic installations that keep you motivated. Home office is supposed to make life convenient and having control on everything going on. Big windows, large desks and reclining sofa would be great to make you feel comfortable in everything that you do. We home these ideas were inspiring enough! Creating a home office space is an exciting phase in anyone’s life. If you already know what we mean, do share some glimpses to your offices!